I am back to Hyderabad from Pondicherry (where I was for Christmas and it was great!) sparing myself a few days before the New Year’s eve to work on this post about my memories and experiences from the year 2014. Facebook does a good deed with your year end reviews but nothing better than working it out yourself, no? 2014 has been a very travel extensive year for me. I got out of my engineering, got a job, got a bike, and the rest was connecting the dots. Love for travel, availability of bike and money merged with weekend offs prepared the recipe for what was to come. A lot of stories are yet to be covered but some glimpses you will find here. So, come join me in recounting some of my experiences. Riding. I started with small (150 to 800kms) weekend rides to Hampi, Warangal, Medak and Ananthgiri Hills from Hyderabad. With the increasing wanderlust, I left for my longest ride (1,882 kms) then which spanned 5 days across 3 states Karnataka, Goa and AP. 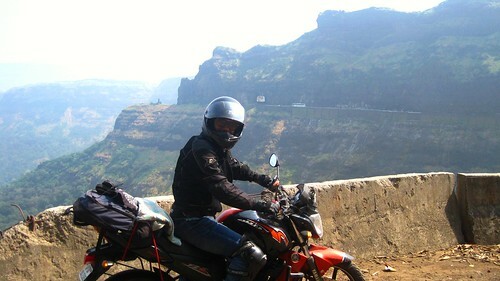 A few months after, I left for an even bigger ride to the offbeat hills of Maharashtra. Riding on an incline overlooking the valleys and facing rolling stones from the road was a thrilling experience. A weekend ride to Adilabad left me with amazing experiences at Kala Ashram and Kawal Tiger Reserve. Very recently, I had a chance to ride to Srisailam Dam, another weekend ride of around 550 kms with some new biker mates and no less it was! Trekking and Camping. 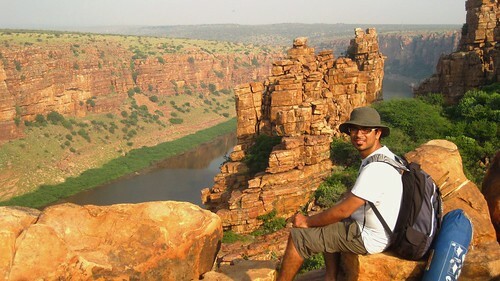 Adventure Travel has been one thing I started only recently with basic treks in Hyderabad for beginners and I loved them all. In the monsoons, I had the best experience of trekking and camping at the Dudhsagar Waterfalls. I was slowly learning about my interest in camping as well and went on to camp solo for the first time at Apsarakonda Beach. Gaining confidence from these experiences, the rest of the year saw me organizing a lot of treks and camping avenues for my friends at Bhongir Fort, Kerala, Gandikota, in the heart of Nallamala Forest at Ahobilam, Rajgad Fort in Maharashtra and very recently at Pondicherry. 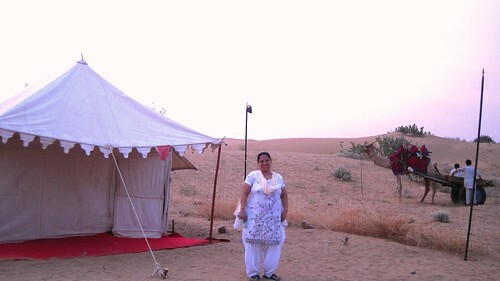 But one of the best moments would still be when I could convince my parents to stay in the desert camps in Thar Desert! Landscapes. Luckily, I travelled to the Mountains, Seas and Deserts in the same year. I visited Sayhadris in Maharshatra during my ride and again when I went there for the Rajgad Torna trek. Things turned in my favor and I visited the Indian East Coast and the West in the same year. I biked along the Murudeswar Goa belt and witnessed my share of seas and beaches and once again biked along the East Coast from Chennai to Pondicherry. Putting it in another words, I saw the Sun rising on the East Coast at Paradise Beach in Pondicherry and saw it setting in the sea again at the Apsarakonda beach in Karnataka. On a drive to the golden city Jaisalmer from Ahmedabad with family, the sand dunes of Thar Desert presented themselves with their vastness which extended beyond the borders men had drawn. Learning. It is 1000% correct that Travel teaches you what the best books can’t. I learnt most importantly to trust people, and that the hatred, the big crisis over safety are a lot media hyped. Sure, there have been cases of all kinds, but the humble and simple people I met on my travels did indeed make me think otherwise. Another important lesson I learnt was the importance of your gear (biking and otherwise). While biking gears have proved life savers for me, much simpler things like mosquito repellants have come to my rescue a million times. 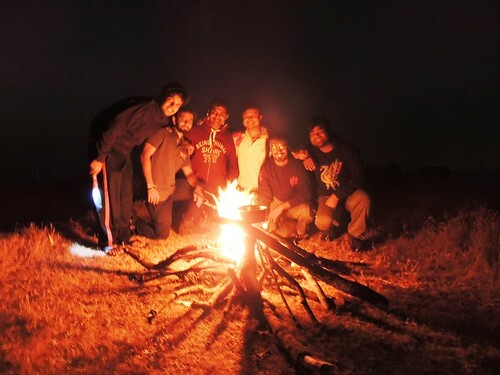 How to light camp fire and how to pitch the tents amidst strong wind blast were also big lessons learnt in practicals, not the theory classes. And yes, cards! Always carry them! ¶¶ Having lunch at a villager’s hut in a secluded village in the heart of Sahyadris. ¶¶ Wild safari in Adilabad Tiger reserve. On my bike. ¶¶ Learning about the transformation at Auroville. ¶¶ Witnessing Shivaji Jayanti celebrations at Belgaum, totally unplanned. ¶¶ Having mind blown with the beauty, and wilderness at Ahobilam. ¶¶ Camping solo at Apsarakonda Beach. ¶¶ Growing as a blogger. I was very unsure and not very confident when I first thought about documenting my travels. But the positive response I have received from my readers, family and friends has always left me deeply moved, so it has to be a major highlight for me personally. Taking the positives from this year and learning from the negatives, I look forward to 2015 and the surprises and adventures it holds for me. I wish that all of you have a very positive 2015 and hope that above all, what you want to do, you do. That’s the mantra I adopt till the next one strikes me. Funny, sure! Meaningful, you bet! Have any comments to share? Please do. See you in the New Year! As they say, if you like my travels and stories, you can visit my FB Page here, or subscribe to this space to follow my travels. 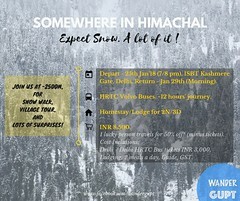 Rumi has said it rightly “Travel brings power and love back into your life.” Indeed travel does wonders to one’s life and it teaches a lot of things to the traveler. Hi Jatin, I know you already got the nomination for ‘Very Inspiring blogger award’. 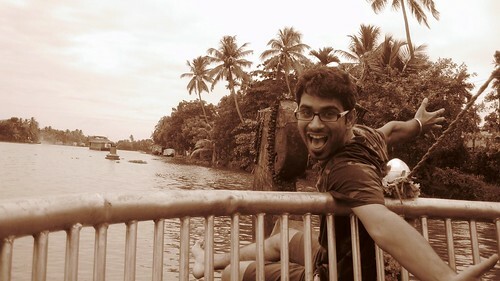 But As I follow your travel stories ardently couldn’t but chose you for the same in my blog http://footlooseforever.com/2014/12/31/very-inspiring-blogger-award-my-inspiration/. Wish you many more exciting travels in 2015. Good write up. Felt having visited the places. Thank you so much. Wish you a very happy New Year! A lovely post, and that sounds like a great year! A long road trip on a bike (although I can’t drive one, I’ll have to ride pillion!) is something I’ve really wanted to do for a long time. Maybe it’ll happen some time. 🙂 Wish you many more amazing travels in 2015! Thank you so much Rajesh and wish you the same. Nice post Jatin. Good to know that just after completing your engineering, you are making the most of life by travelling and documenting your travels, alongside your job. My best wishes. Have a fabulous year ahead. You had an awesome 2014 😀 Wish you more exciting travels in 2015! I hope your journey of 2015 will be as good as 2014 or may be much better! Thank you so much! And wish you the same. Wishing you a whole lot of travel in 2015 too. I wish too a very happening 2015! Beautiful pictures! The third one is Lovely! Really,I mean….how can one write so nicely? 😛 just kidding…. So,this was your year ending post han? I hope you were not being sarcastic, haha. 😀 Thanks and wish you the same. Wish u amazing things in 2015. Keep it at it.